Taste, pedal, relax, and climb your way across the south of France. Unparalleled Peace and Beauty in Provence! If you have longed for a visit to Provence, join us for a bike tour that highlights the best of the region. Our Provence bike tours are exceptional for groups of riders with different riding abilities. All riders will be satisfied! Pedal through endless fields of sunflowers and lavender, and journey to some of the most cherished vineyards in all of France. Experience the Luberon of Peter Mayle’s “A Year in Provence”, the heights of Mt. Ventoux, and the rolling vineyards of the Gigondas and Beaumes-de-Venise. 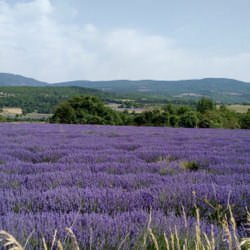 Make your next vacation a customized bicycle tour through majestic Provence to experience the natural beauty and culture of this very special land. 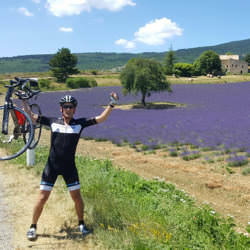 Our custom Provence bike tours begin just outside of Avignon and loop through the Vaucluse Department, and the Luberon. You have options to visit beautiful villages in the Vaucluse including Vaison La Romaine, Gordes, Bedoin, Sault, and many others. Pedal through famed wine villages such as Gigondas and Beaumes-de-Venise, and taste along the way! 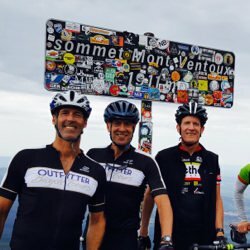 Depending on your itinerary, you may have a chance to test your legs on Mont Ventoux, the “Giant of Provence,” which will call you to conquer it. If you prefer more relaxed riding, your enjoyment will be no less. Our riding routes are smooth and separate from busier main roads. Let us curate and customize one of our Provence bike tours for you! Self-Guided Bike Tours & Guided Bike Tours in Provence, France.